The Jakobshavn Glacier in West Greenland produces around 10% of all Greenland icebergs. Some 35 billion tones of icebergs calve off and pass out of the fjord every year. Icebergs breaking from the glacier are often so large (up to a kilometer in height) that they are too tall to float down the fjord and lie stuck on the bottom of its shallower areas, sometimes for years. Jakobshavn is one of the fastest moving glaciers, flowing at speeds of around 20 meters per day. 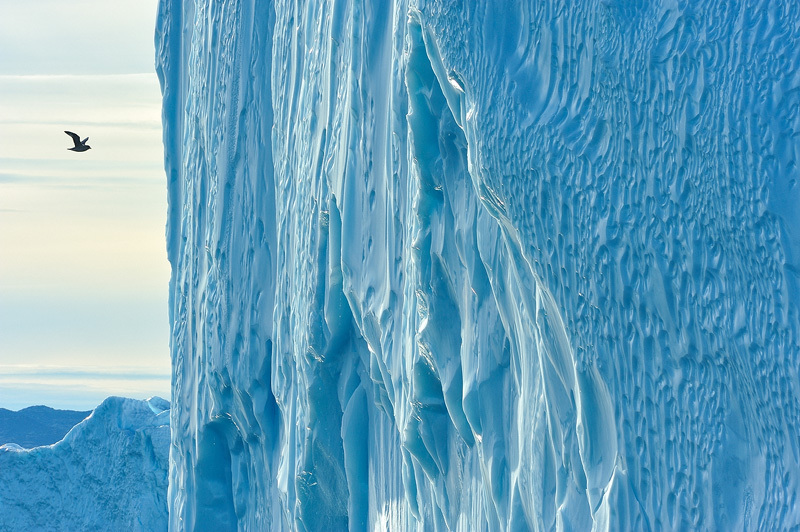 I when photographing one of the many giant icebergs in this area, I decided to include a passing bird to better show the scale of these skyscrapers of ice.